The Hubble Ultra Deep Field: A million-second-long exposure in one of the darkest parts of the sky reveals the first galaxies to emerge from the so-called "dark ages," the time shortly after the big bang when the first stars reheated the cold, dark universe. This view is actually two separate images taken by Hubble's Advanced Camera for Surveys and the Near Infrared Camera and Multi-object Spectrometer. What does the universe look like? How many galaxies, stars and planets are out there? What is the age distribution of the stars? How many habitable planets are there? If only astronomers could send a census form to every galaxy in the universe! Instead, figuring out what the universe looks like requires a much more indirect approach—observing objects from great distances and creating models that describe these observations. As observation techniques advance, so does our knowledge about the universe. One recent observational study led by Pieter van Dokkum (Yale) and Charlie Conroy (Harvard-Smithsonian Center for Astrophysics) indicates that there may be three times as many stars as previously thought! In the study astronomers looked at the light coming from eight nearby galaxies in order to determine how the number of low mass stars compares to the number of high mass stars. They were looking specifically at elliptical galaxies, which look like big, smooth bulges in contrast with the disk structure of spiral galaxies. The stars in elliptical galaxies are older than those in spiral galaxies like our Milky Way, and elliptical galaxies contain less dust and gas--meaning not many new stars are forming there. The mass of the sun is roughly 2x10^30 kg (about 333,000 times the mass of the Earth). The low mass stars that the astronomers were looking for have a mass less than1/3 that of the sun. These stars, known as red dwarfs because of their size and color, are cool, dim stars, which makes them hard to observe unless they are very close. Red dwarfs are the most common type of star in the universe. L: This image of the elliptical galaxy NGC 1132 and its surrounding region combines data from NASA's Chandra X-ray Observatory and the Hubble Space Telescope. The blue/purple in the image is the x-ray glow from hot, diffuse gas detected by Chandra. Hubble's data reveal a giant foreground elliptical galaxy, plus numerous dwarf galaxies in its neighborhood, and many much more distant galaxies in the background. R: A composite image of the spiral galaxy Messier 81 from NASA's Spitzer and Hubble space telescopes and NASA's Galaxy Evolution Explorer. It is located about 12 million light-years away in the Ursa Major constellation and is one of the brightest galaxies that can be seen from Earth through telescopes. Since astronomers use their observations as the basis for creating models to explain how the universe has evolved over time, a change in the input of the number and kinds of stars in each type of galaxy can have a big effect on our understanding of the history of the universe. Red dwarfs are hard to observe, so previously scientists assumed that elliptical galaxies had the same ratio of red dwarf stars to stars like the sun (100:1) as do spiral galaxies like ours. However, this new study shows that elliptical galaxies may have ten times more red dwarf stars than astronomers thought! How did the astronomers observe the red dwarf stars? The twin Keck telescopes take their final views of the cosmos as the sun begins to rise over Mauna Kea. The observing methods astronomers use have improved enormously since Galileo Galilei turned a crude telescope to the sky 400 years ago. Today astronomers use all kinds of sophisticated tools to capture individual photons coming from the darkest patches of sky. For this study, astronomers used a specially modified spectrometer attached to one of the 10-meter, 300-ton telescopes at Keck Observatory, located on Hawaii’s Mauna Kea. A spectrometer is a device that analyzes light and outputs information about the intensity of the light at different wavelengths. Spectrometers are often used in astronomy. When light from an object at which a telescope is pointed passes through a spectrometer, the spectrometer produces a graph of wavelength versus intensity (brightness) for the object. This is powerful information because different materials emit and reflect light of different wavelengths by different amounts. The resulting light spectrum gives unique information about the source of the light and the kinds of materials that the light passed through before entering the spectrometer. For example, Figure 1 shows the spectrum for galaxy IRAS F00183-7111. The peaks and valleys in the graph indicate the presence of different kinds of materials, as indicated in the graph. Like water ice and neon gas, the light coming from a red dwarf star has its own spectral signature. Although red dwarfs are dim stars, the astronomers reasoned that if there were enough of them in an elliptical galaxy, they would show up in the galaxy’s light spectrum. Then, based on the brightness, the scientists could estimate how many red dwarfs were in the galaxy. Their technique worked—and they found that instead of a ratio of approximately 100 red dwarfs to each sun-like star, there were 1,000! About one-third of the galaxies in the universe are elliptical galaxies, which means that there could be three times more stars than previously estimated. 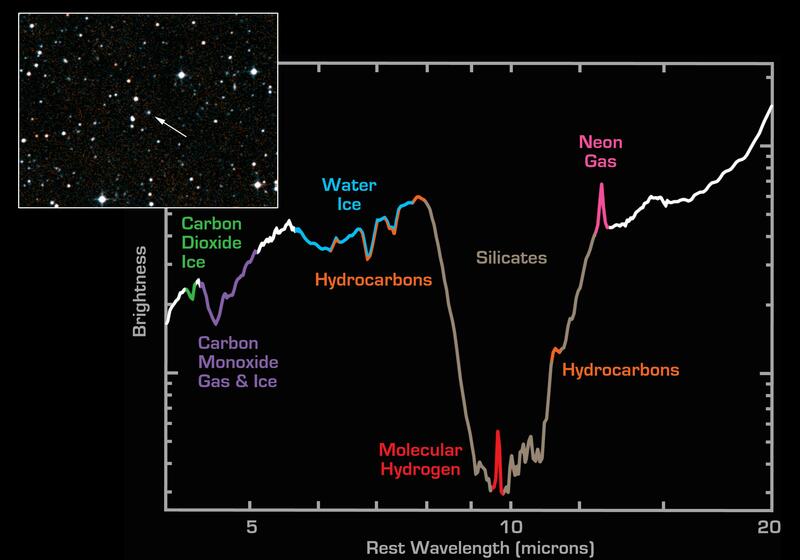 Figure 1: The spectrum from faint galaxy IRAS F00183-7111, taken from the Spitzer Space Telescope infrared spectrograph. How many earth-like planets are there, and are they inhabitable? The presence of these additional red dwarf stars just might have something to say about these questions. Stay tuned!